WE BUILD, WE OPERATE, WE MAINTAIN! The Operating Engineers Local 324 Labor-Management Education Committee takes a strong, positive approach to addressing the issues and concerns which affect labor management relations and economic development in the State of Michigan. 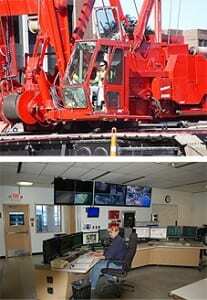 Operating Engineers break ground for most construction projects, are on the job until it’s topped off and then operate the facility that was constructed. Therefore, it’s only fitting that these same people are “breaking ground” for the new spirit of cooperation between labor and management on and off the job site. The Operating Engineers Local 324 Labor-Management Education Committee is proud to be a leader in the promotion of “Building Relationships That Work”. There are currently over 16,000 members of the local and this number continues to grow. This significant group and the employer associations are truly committed to the concept of Working Together Toward Successful Solutions. This commitment is supported by a per hour deduction from the wages of each Operating Engineer. Together we are working toward a better, safer product which brings you, the customer, greater value for each construction dollar spent. Laborers’ Local Union 1191 is committed to protect and improve the quality and security of our members’ working conditions and personal lives through pro-active representation, effective political action, and open communication, supported by education and training programs designed to empower Union members. In all activities, Laborers’ Local Union 1191 will strive to uphold the democratic process of decision making and participation by the members. Laborers’ Local 1191 received its charter from the Laborers’ International Union of North America (LIUNA) on September 17, 1937. Today the Local represents more than 4,000 Laborers across Michigan in the construction industry. Working in partnership with its Union Contractors, Local 1191 created its own Laborers’-Employers Cooperation and Education Trust (LECET). This fund created to promote Local 1191 and union construction, to educate and train members, and to help generate project and job opportunities for the membership. We have worked tirelessly over the years to negotiate excellent wages, pensions, and health insurance and vacation benefits for its members. The Local actively lobbies at the Federal, State and Local levels for favorable results with issues that affect its members, such as federal and state highway funding, unemployment benefits, construction safety and much more. Laborers’ Local 1191 is committed to continuing its proud history of dedicated service to its membership and the construction industry working to improve conditions now and well into the future. The Michigan Infrastructure and Transportation Association (MITA) is a statewide construction trade association that consists of nearly 600 Michigan companies representing construction disciplines such as road and bridge, sewer and water, utility, railroad, excavation and specialty construction throughout the state of Michigan. After over 50 years of professional service, Cadillac Asphalt remains committed to providing customers with high-quality materials, precision craftsmanship and cost-effective solutions. As America’s largest supplier of asphalt aggregates and liquid asphalt cement, we control the source and quality of all materials — allowing us to meet or exceed specifications for any project on any deadline.